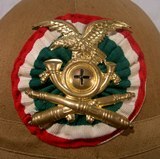 Pit helmet for mountain troops artillery. Pit helmet pattern '35 for mountain troops artillery. 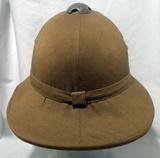 Brass front badge and tricolour cockade in wool. These pit helmets were used in East Africa and in North Africa front during World War II. The italian mountain troops artillery has fought mostly during the campaign in East African between 1935 and 1937. The pit helmet, complete with his chinstrap, has the green canvas lining with traces of a repair. Inside is visible, made with ink stamp, the indication of the size: 58. The cork is in excellent condition with no breaks. Notify me of updates to Pit helmet for mountain troops artillery.